The Payment Card Industry Data Security Standard (PCI DSS) compliance is a set of specific security standards developed by the payment brands* to help promote consistent data security measures needed to protect sensitive payment-card information. The standard applies to all organizations which hold, process, or exchange cardholder information from any card branded with the logo of the payment brand companies. 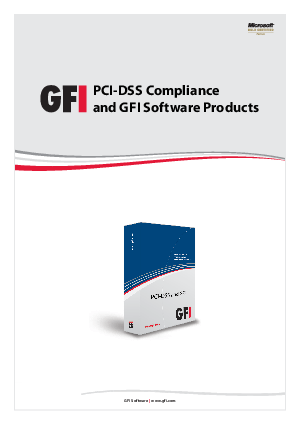 The intent of this document is to provide you with GFI's understanding of the PCI DSS requirements and how the GFI Software product line can assist you to meet those requirements. *Payment brand companies include American Express, Discover Financial Services, JCB International, MasterCard Worldwide and Visa Inc. International.